One of the best things about living in Southern California, or even just visiting the area, is the excellent year round weather. If you enjoy spending time outside, then there is no better place to be. Granted, the air quality is not that great, so some days it is not in your best interest to get your heart rate up outside. 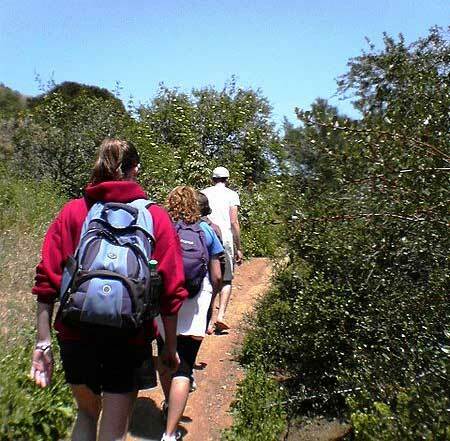 However, if the air quality is decent and you’re looking for a fun way to spend a few hours, then you can find some great hiking trails in the greater Los Angeles area. Just about 25 miles outside of Los Angeles, you will find this 3.5 mile trail. Not only do you get some nice scenery on the hike – a lake, a rock pool and lots of greenery – but you can also see evidence of Hollywood using this trail. You’ll come across props from the television show M*A*S*H and the rock wall that was used in the Planet of the Apes movie. If you’re interested in the serenity of a waterfall, then this 4.2 mile hike is a good choice for you. The trail is about 17 miles outside of Santa Monica and ends with the payoff of a 50 foot tall waterfall. The climb to it is a nice gradual one, with lots of canyon walls and trees along the way. It’s definitely a great hike to get away from the stress of the city. For a bit longer of a hike, try this 10 mile trail that takes you along the east fork of the San Gabriel River. Your hike will take you to a 120 foot high concrete bridge in the middle of a canyon, which is quite a site. You’ll also see tunnels and river crossings on your trek. Possibly one of the most scenic hikes in the Los Angeles area, this one comes it at around 6 miles. Start out at Trippet Ranch and take in stunning canyon and ocean views on your way to Parker Mesa Overlook. You’ll be able to see the San Gabriel Mountains, Catalina Island and the Santa Monica coastline. This hard to find trail is a must for the adventure seekers out there. The slot hike is located in Anza Borrego State Park, but is only accessible via a hard to find dirt road. Yup, you’ll have to do your homework on this one. The payoff is worth it though as you get a hike that takes you down into a slot canyon, after some areas where you have to slide through sideways, and lets you walk along it for about a mile. The end result is that you are about 75 feet below the canyon wall, which makes for a great view. These are five of the many hiking trails that you can find not too far outside of Los Angeles. Check these out, if you haven’t already done so, or head out to Mojave National Preserve or Joshua Tree National Park for some even more scenic hikes in Southern California.